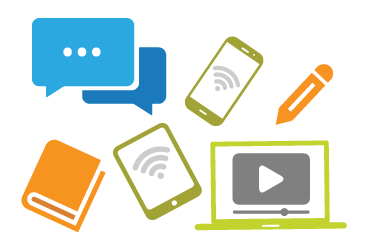 Creating online courses is one thing, creating courses that are both effective and engaging is another. With all the effort that goes into course development, why wouldn’t you ensure that the learning material is being well-received, and is effective? Effective and engaging eLearning programs are ones that deliver meaningful material, that enhance learner interest and increase learner retention. Here are 4 ways to create effective and engaging eLearning programs. The look of your course will be the first thing to draw your learners in, so having a good instructional design is key. Even if you don’t have a background in instructional design, simply learning the basics will greatly improve your courses. How can you learn more without making a huge commitment? There are a few different resources you can access. Rapid eLearning Blog - Run by Tom Kuhlmann at Articulate, this blog provides great tips and tricks for instructional design best practices, that are very straightforward and easy to understand. New blog posts are published weekly. Limestone Learning - A custom learning development company, Limestone Learning hosts webinars and publishes blogs that provide expert information on this topic. Association of Talent Development (ATD) - This is a good option if you have a bit more time and money to invest. ATD offers great courses on instructional design. Help learners understand why the learning is important, by describing the benefits of taking the course. For example, which knowledge gaps will the course fill? Is this course going to make their job easier, or safer? Are there negative consequences for not taking this course? In addition, you can use storytelling tactics, and case studies to create an interesting and followable course narrative. Make sure that the eLearning you are presenting has a very clear connection back to the job. Every organization has a goal they are trying to collectively achieve through all of their efforts, so make sure the eLearning and training you are delivering helps drive you towards that goal. This can be done through realistic questions, scenario-based learning, and interactive exercises that tie back to what they have to do on the job. Ultimately, you should help learners apply the skills you want them to perform on the job. This model helps establish purpose in your eLearning and training programs. The of your eLearning environment must fit with that of your workplace - make it as close as possible to the real environment. refers to the motivation or urgency to act. In this case, use realistic challenges that the learners might face on the job. For example, having to provide your employee with feedback on their performance. The is the process you go through to help learners overcome the Challenge. If we follow the last example, it would be practicing providing employee feedback. refers to the assessment given to the learner about the effectiveness of their actions in this CCAF process. Design - If the analysis identifies a performance gap, the design phase will outline the performance objectives. 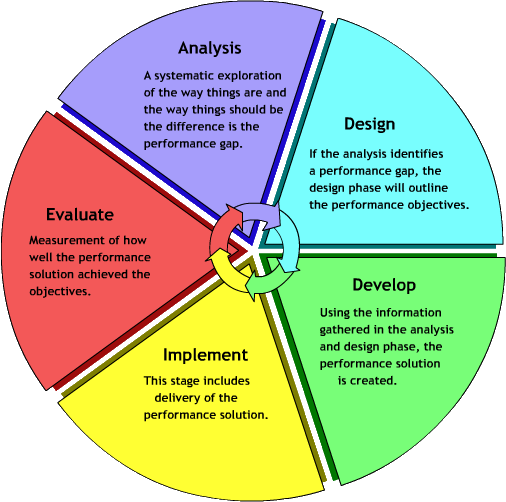 Develop - A performance solution is developed using the information gathered in the analysis and design phase. Implementation - This stage includes delivery of the performance solution. Evaluate - Measurement of how well the performance solution achieved the objectives. This is a very high level model, but it provides a framework to get started, and set up realistic timelines to complete each stage, allowing more efficient use of time. This model helps you organize the tasks and expectations for team members, so put your timeline together and share it with your team. This way, everyone knows what’s expected of them, and how long they have to complete their tasks. Hiring a contract editor to copy edit and quality check your work is highly recommended. No matter how many times you review your course, there are always things you will overlook because you are close to the material. Having a fresh set of eyes to look over your work ensures a better quality course. If you have style guides, quality standards, or compliance standards, your editor will use these as a guide to make sure the course remains within your required standards.